HOT Plum District 30% Off & Nature Baby Care Diaper Deal! You can use this first deal to get an even better deal on a voucher to EcoMom.com this week, a site offering all-natural and organic products for babies, kids, and parents. For $30, you can snag a $60 voucher. But then use the plumlove code at checkout to bump the price down to just $21! Shipping is included. Visit Plum District under their “everywhere” deals, to find the EcoMom sale. 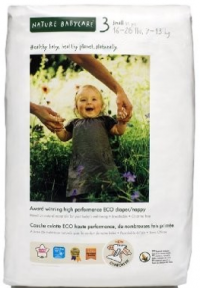 If you’re in the market for diapers, here’s a great way to get a nice deal on some chlorine-free, eco-friendly ones using this Plum District deal. Buy the EcoMom voucher for $21, after using the promo code plumlove at checkout. Add 5 packs of Nature BabyCare diapers to your shopping cart. Go to checkout and enter your PlumDistrict voucher code. Your total should be $0 with free shipping. Proceed through checkout. That comes out to paying just $4.20 a pack for eco-friendly diapers, or (13.5 cents each for size 3). If the EcoMom deal doesn’t interest you, Plum District also has a half off voucher to Halloween Mart this week!